Here is the inclusion list for the Mix & Match Buy 6, Save $3 Mega sale that starts on Wednesday, 4/10 and runs through Tuesday 4/23. 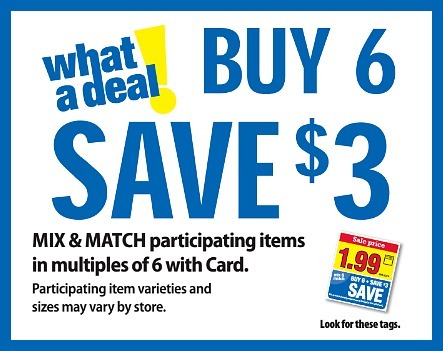 With this sale you will instantly save $3 at checkout when you buy any 6 participating items. Just a reminder, all prices are AFTER mega savings. I’ll get the rest of the items added when the sale starts on Wednesday. If you find any other matching coupons or if you find a coupon that doesn’t match, let me know and I will get it added or fixed as soon as possible. Thanks for all you do to save me and my family money. I appreciate all the hard work you do. Have a great day!